Home » Decorate on a Budget – To Paint or Not to Paint? Decorate on a Budget – To Paint or Not to Paint? With the exterior of the house finished, my thoughts are racing ahead to the interior. I see it all finished in my mind’s eye and I’m already getting my decorating plan ready! Being frugal, the key for me is to decorate on a budget using what I have when possible. 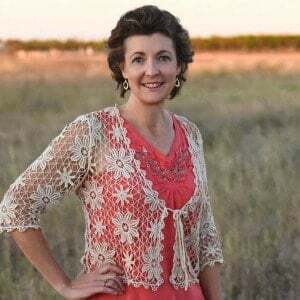 Thankfully, I have a friend who is an interior designer and she is our guest today to talk about how to decorate on a budget and how to decide to paint or not to paint. Painted furniture is very trendy right now but it has actually been around for a long time. Painted furniture was particularly prevalent in during the 1790 -1880’s in America, but its history goes way back. Egyptians perfected the art of painting and gilding furniture, sarcophaguses and motif designs on pottery. The Chinese used resin lacquer. In the Middle Ages, furniture was ornately painted to enhance religious and cathedral interiors. But, when we think of painting we are usually not thinking of gold gilt (although I have done that! – Photo C below!) We think usually of a French Provincial or distressed style. On painted furniture the accumulation of dirt and polish over time in the carved areas gave furniture that aged patina look. Today, we pay good money for that! A little less cleanliness might up the style of your favorite piece! The oldest form of paint created by the Egyptians was a form of milk paint. Milk protein (casein), lime and pigments were added together to create a soft, velvety look. In Colonial times, itinerant painters would travel the countryside with their special pigments. Since every farm most likely had a milk cow, the milk and lime on hand were used to mix with the pigments to create paint. This is why painted furniture in America is so closely associated with the Country Look. 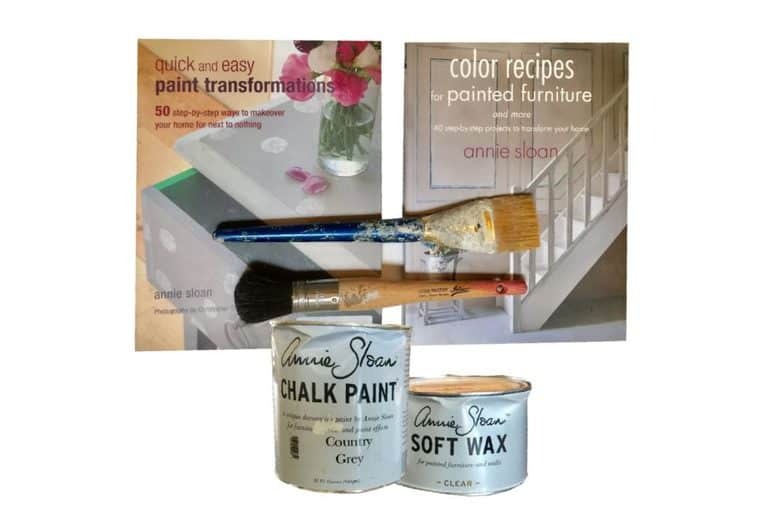 Many today use Milk or Chalk Paint when updating furniture. They have different strengths but both adhere well to surfaces. 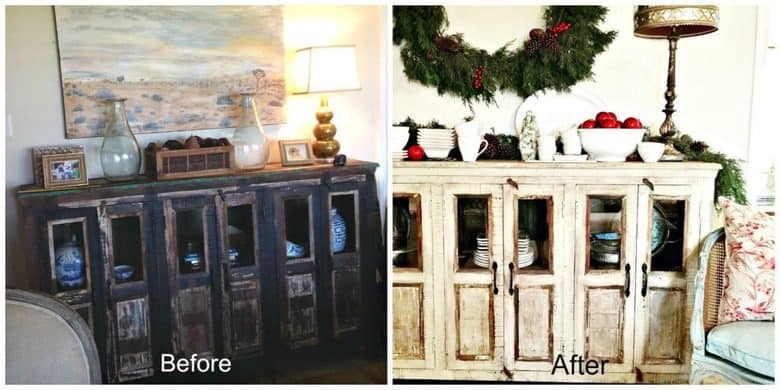 Chalk Paint is sort of known for adhering without sanding. However, I always give a light sanding before painting. If you have a piece that you are comfortable painting, I recommend either Rust-Oleum Chalk Paint for most applications because it is almost fool proof! Here are two books worth investing in for step-by-step instructions that ANYONE can follow. Quick and Easy Paint Transformations and Color Recipes for Painted Furniture. All of the below techniques are shown in detail in her books. There are other chalk paints available like Valspar Chalk Paint. Milk Paint’s popularity is on the rise because it has creamy hues that works well with distressing techniques. Today we call painting “up-dating” our furniture; but really are we “back-dating “it?! KEEP CALM. TAKE A DEEP BREATH. PAINT. This space always seemed dark and depressing. So, I dry brushed a little Annie Sloan Country Gray Paint onto this rustic chest. Problem solved! I have to admit the burl wood on this buffet was beautiful and I had to swallow hard when I painted that first stroke, but Wow!-the paint really freshened it up! As you can see, I left the wood finish on the top. (My little compromise with myself.) 🙂 No regrets. 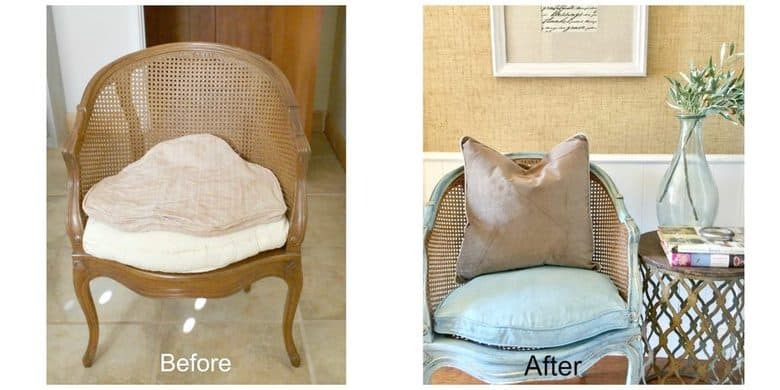 This chair from a consignment store was the perfect piece to try out the distressed (with a little gold gilt peeking through) technique. I did this for my niece’s dorm room!